From The Stage Thursday 17 February 1944. From The Western Morning News of 8 February, 1944. "MICHAEL AND MARY." For the first time in the city, Paulette and Patrick Ludlow played opposite each other at the Theatre Royal, Exeter, last night. They were co-stars in the name parts of A. A. Milne's thrilling play Michael and Mary," in which love, deceit, perjury, comedy, and drama were the headlines of an absorbing story. The Ludlows were at ease in all the contrasting scenes and situations, acting with a simplicity and .restraint in their portrayals of characters demanding careful study and the best interpretation. They were supported by a strong cast, particularly Charles Mortimor, of " Young Woodley " fame. The play was not only well acted, but excellently produced. There are matinees on Thursday and Saturday. 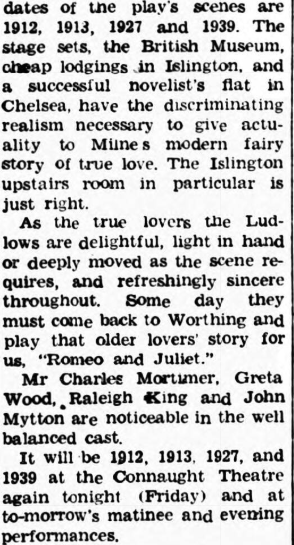 "...polished performances were given by allin the cast, which includes Frederick Annerley, Brenda Gay, Greta Wood, Charles Mortimer, Frank Henry, John Hurrell, Jean Haines, Cathleen James and Ronald Nelson." From The Western Morning News of 15 February, 1944. Mr. A. A. Milne's attractive play, " Michael and Mary," is at the Torquay Pavilion this week. Opening in the early days of the century, the play shows first the meeting of young Michael with Mary, whose husband has decamped to America. Soon we have them marrying, and there is a dramatic scene when the husband turns up with designs for blackmail. In a scuffle which ensues the would-be blackmailer falls dead with a heart attack. Michael and Mary are faced with admitting their bigamous marriage or making out Mary's husband to be itinerant cadger. For their schoolboy son's sake they choose the latter course. 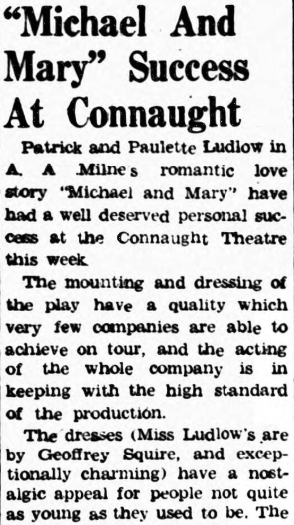 The production stars Patrick and Paulette Ludlow, who make the most of the many novel twists in this delightful play. 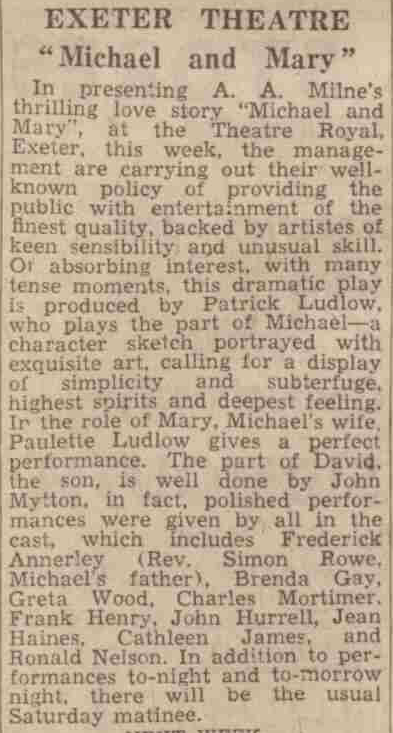 Greta Wood played Mrs Tullivant, in the 1944 production of "Michael and Mary" at the Theatre Royal, Exeter. Also in the play was Charles Mortimer. 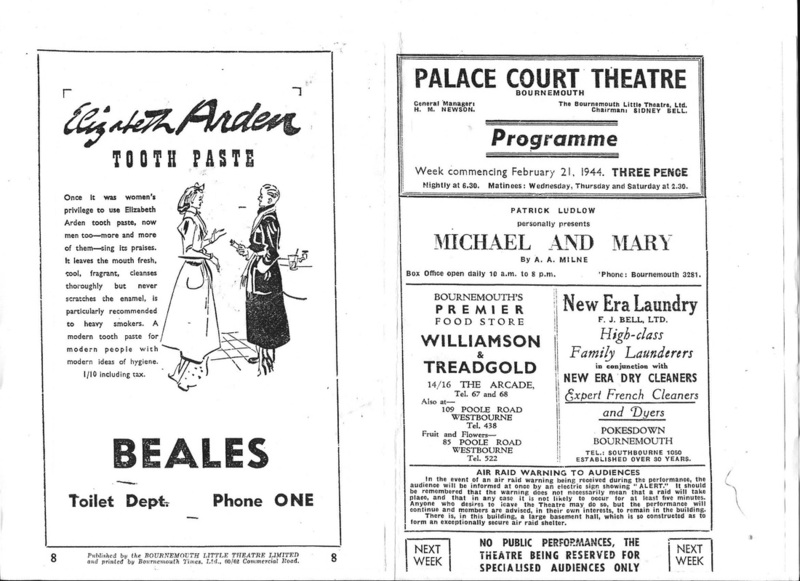 The play was also to be seen at the Palace Court Theatre, Bournemouth. 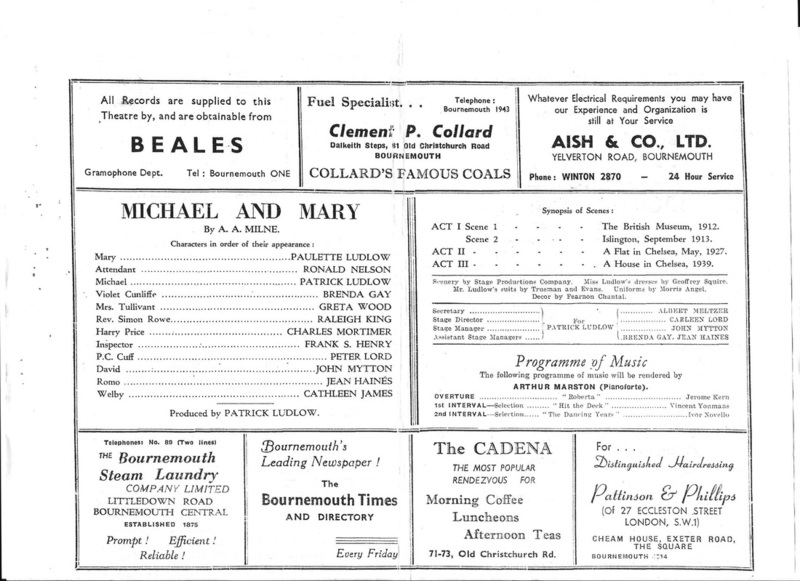 A copy of the programme for "Michael and Mary" at the Palace Theatre, Bournemouth, in 1944.